Unlike traditional teaching methods, this style provides students with an interactive approach to learning that focuses on independent problem solving, self-discovery, and nature intensive learning. This unique methodology of teaching focuses specifically on the development of the child, and provides them with an atmosphere where they can learn through both traditional teaching and self-directed learning. Italian educator and physician, Dr. Maria Montessori developed this philosophy after countless years of observation of children in the early 1900s. Over the last one hundred years, her unique methods have led to the creation of more than 7,000 schools worldwide (4,000 in the US) that use her philosophy to educate students. The primary goal of a Montessori education is to provide children with a stimulating environment where students are freer to explore subjects and appreciate learning during the course of their tutelage. The philosophy of Dr. Montessori seeks to instill a love of learning that does not end when a child’s education is completed. See a panoramic view of Miss Lori’s old classroom that shows each area. Tools and skills used in everyday life are demonstrated in this area of the classroom. Not only do children learn life skills like scrubbing, sewing, buttoning, zipping and sweeping but through performing these activities they develop concentration, coordination, and a sense of order. A variety of materials specifically designed to develop the child’s senses to be more keenly aware of differences among objects. Activities to develop the sense of smell, taste, touch, sight, and hearing are provided. These materials help to prepare children for math and language, as well as develop their concentration, coordination, sense of order, etc. Includes materials that teach counting, place value, operations, fractions, telling time, etc. These materials are very concrete and allow the child to see, touch and explore in order to develop an understanding of math concepts. 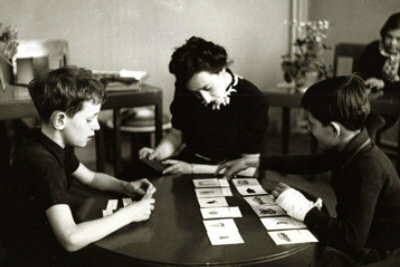 Maria Montessori believed that children’s minds were naturally mathematical and by providing concrete materials they are able to comprehend fairly complex mathematical concepts at a much earlier age. Studies have shown that Montessori educated children score higher in math and science on college entrance exams. Beginning with vocabulary, matching, rhyming and beginning sound activities and advancing to building of phonetic words and words containing phonograms. This area is highly successful because it is a phonetic based system of learning language that also incorporates a very concrete approach using real objects and tactile letters so that students are able to absorb information through various senses that were previously trained in the sensorial area of the classroom. From land, air, water to maps of each continent or basic science experiments like sink & float or magnetic/non-magnetic, children love these hands on science and geography lessons. Opportunity to explore with art and music materials to compose your own masterpiece is the philosophy in these areas. The teacher demonstrates how to use the material, just as in any other area, and then the child is free to create. Among the five year olds, Montessori students proved to be significantly better prepared for elementary school in reading and math skills than the non-Montessori children. They also tested better on “executive function,” the ability to adapt to changing and more complex problems, an indicator of future school and life success.